The Steelers travel across the state to take on the defending Super Bowl Champion Eagles in their preseason opener on Thursday night. Like last year, many of the Steelers big-name starters will not dress for the game, so this will mostly be a showcase of the backups. Nevertheless, this will be the first major test for many players as they fight for their positions on the roster. The Steelers released their initial depth chart over the weekend, but it does not mean much as the first chart of the year typically organizes players based on length of tenure with the team. This means that all of the rookie draft picks appear at the bottom of the depth chart until they see some game action. Here’s a look at some of the key position battles to watch in Thursday night’s preseason opener. The team made it clear last week that Landry Jones is still the #2 quarterback. In all likelihood, this means Jones will get the start against Philadelphia. I would not expect him to play more than a quarter, and possibly as few as 2 series. Coach Tomlin said that Dobbs will get into the game next with Rudolph finishing it off. Both have had up-and-down camps so far. The common thought is that the Steelers will only keep 3 quarterbacks so Dobbs could be fighting for a roster spot. Dobbs is still eligible for the Practice Squad if the Steelers are able to get him through waivers. Le’Veon Bell and James Conner are locks to make the team. Conner will likely take over the starting role for the preseason. Early reports from camp have been good on Ridley while Toussaint is somewhat of a known commodity for the team. Samuels was a 5th round pick who entered camp with high expectations as a swing RB/FB/TE but has struggled a bit in the blocking department. This game will be an important test to see how he is progressing. 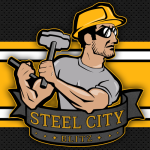 Another factor to watch is how the Steelers deploy their RBs in certain situations. Will we see more of a fullback in short-yardage? This roster battle really comes down to how many receivers the Steelers want to keep. 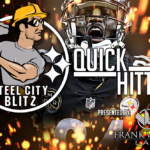 Antonio Brown, JuJu Smith-Schuster, and second round pick James Washington are roster locks. Darrius Heyward-Bey is nearly a lock because of his prowess on Special Teams and his veteran leadership. Last year they had 6 on the roster with Hunter serving as an insurance policy for Martavis Bryant. The difficulty with Hunter is that he does not play special teams. Tucker is a slot receiver who spent last year on the practice squad and has the inside track to a spot if Eli Rogers remains on the PUP list. The other four are undrafted players looking to make names for themselves. Patterson has flashed in training camp and we will see if that carries over to the games. Henderson’s best chance to make the team may be as a returner, so we will see if he gets time there. Given that the Steelers are in some kind of sub package for over 75% of their defensive snaps means that the value of the Nose Tackle position is somewhat limited. That said, what the Steelers truly lack is a stout, two-gapping NT that can plug up the middle against the run. Particularly in short-yardage situations, this lack of a true run-stuffing NT has reared it’s ugly head. Javon Hargrave is a good player but he is more of a penetrator that can’t knuckle down and hold his own in the trenches. McCullers has the mass to be that kind of player, but his height has been a liability where he can not get his center of gravity low enough to have an impact. McCullers also doesn’t tend to play with an angry or nasty streak that an ideal interior lineman would have. Josh Frazier was a 7th round pick out of Alabama (the first Crimson Tide player drafted by Colbert) and will likely compete with McCullers for this spot. Frazier was a career backup at Alabama, but with his defensive line coach now coaching the same position with the Steelers, there is an opportunity for Frazier to win a roster spot. While a lot of eyes will be focused on the battle between Jon Bostic and Tyler Matakevich for the starting Mack Linebacker spot, the competition at the bottom will be just as interesting. LJ Fort was forced into duty last year on third downs because of all the injuries but is mostly a special teams player. Matt Galambos looked solid in the preseason last year and spent time on the practice squad. Keith Kelsey was also in camp last year. Matthew Thomas is an incredibly athletic player who was an undrafted free agent out of Florida State that has been good in camp so far but needs to continue his upward trend by flashing on the field. The big news at outside linebacker was TJ Watt and Bud Dupree flipping sides, and those two will see a majority of snaps this season with Anthony Chickillo serving as the top backup. Last year’s 7th round pick Keion Adams spent the year on injured reserve while Farrington Huguenin was also in camp with the team last year. Ola Adeniyi, another MAC school product, was an undrafted free agent due to being a shorter than typical player, but he plays with great strength and leverage at the point of attack and has drawn comparisons to a young James Harrison. These three are likely fighting over one roster spot and it will likely come down to who performs the best on special teams. Like with wide receiver, this decision comes down to how many corners the Steelers want to keep. The top 4 on the depth chart are set with Artie Burns, Joe Haden, Mike Hilton and Cam Sutton. Last year the Steelers kept 6 CBs which would mean 2 of these 3 make the team. Sensabaugh is a veteran player but has a relatively high salary cap number for a backup, which could put his roster spot in jeopardy if the Steelers want to create a bit more cap space. Allen has proven to be a solid special teams player through two seasons but will likely need to show something more in coverage this year during the preseason. 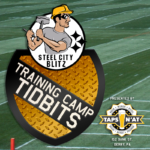 The Steelers traded for Phillips during camp last year and he spent the season on the practice squad. There are some rumors that the Browns have Carl Nassib on the trading block. I can see a pre cut down trade with the Browns, with the Steelers surrendering a 7th round draft pick. Carl would be a nice backup OLB. The Steelers liked him the when he was coming out for the draft.